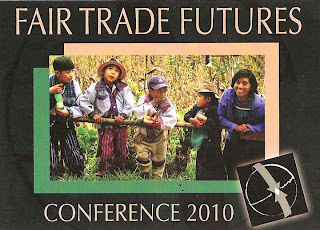 From September 10-12, 2010, the Fair Trade Resource Network (FTRN) and ten partner organizations will bring together 751+ entrepreneurs, producers, students, academics, non- governmental organizations, media representatives, consumers, and activists in Boston, MA for the 2010 Fair Trade Futures Conference. The conference organizers are offering a limited number of scholarships for North American students and for Fair Trade producers/artisans/farmers from outside of Canada and the United States. Each scholarship will pay for one person’s conference registration fees (which include meals). Support is not available at this time for costs associated with travel, accommodations, or other expenses. The scholarship program seeks to assist Fair Trade artisans and farmers from around the world, as well as North American students, defray some of the costs of attending the conference. Person must be a high school-, university- or graduate-level student enrolled as of March 15, 2010, at an educational institution in Canada or the United States. July 15, 2010 - scholarship applications due for Round 2. For more information about the conference schedule click here. For more information about how to register click here.